“I fully believe there will be 24 people voting to override, or at least 23. As we get closer to veto session, we’ll make sure that everybody plans to attend and we’ll double-check and make sure that nobody has changed their mind,” says Kraus. He does not anticipate a filibuster on his measure during September’s veto session. Kraus predicts lawmakers will wrap up in one day. The Missouri Constitution allows up to ten days for a Veto Session. “The previous history on filibusters on veto overrides has been that the majority goes ahead and does what is called the previous question, which stops debate and goes to a vote. I’m not saying that’s what’s going to happen in this situation, but that’s been the previous recent history,” says Kraus. 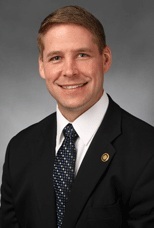 The bill would not take effect unless a constitutional amendment is adopted in November that would ask voters if Missourians should be required to provide an ID to vote. Kraus says his bill will protect the integrity of elections. Democratic Governor Nixon says Missouri already has strong protections in place to prevent voter fraud. Nixon also says Kraus’ bill would disproportionately impact seniors and those with disabilities. Nixon vetoed a similar bill in 2011. The Veto Session begins on September 14 at the Statehouse in Jefferson City.